Construction sites are dusty places, but does that make them dangerous? If the dust contains pulverized rock or concrete there is more concern. One study showed silicosis deaths in the construction industry are higher than any other industry in the United States. Construction workers are clearly at risk of developing silicosis and other lung diseases if they breathe high levels of concrete and rock dust. However, levels fluctuate because of the nature of construction work. This also makes air monitoring challenging on construction sites. To gather enough information about the wide range of construction activities, air monitoring information was pooled from regulators in Washington, Oregon, and the Chicago OSHA office; universities and other research groups; and several construction contractors. This information was collected and analyzed at the University of Washington. 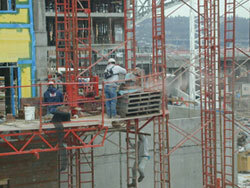 This website was designed to help those in the construction industry anticipate and control silica exposures. You can download a report that describes what was learned from the pooled sampling findings and other University of Washington research on the effectiveness of silica dust controls on construction sites and offers solution options for controlling exposure. Please contact us if you need further information.